My website's Facebook account was hijacked in the early part of 2014 and has never been accessible again. How did it happen? Facebook employed a simple problem-(reaction)-solution trick that led to an artificial internally created demand for private information. Information you would only share with your personal bank, your personal doctor, or with a legitimate government agency. We ask that supporters share this story on their Facebook and other social media accounts to help inform others including Facebook users about the nature of this powerful organization and how they are employing deceptive and malicious tactics to help control and censor the internet from voices of dissent and higher consciousness as well as punish those that expose them. You may be thinking this is an exaggeration or misunderstanding, but in fact I have been observing Facebook for several years and here is how it works. They create a problem of their choice without the need to show any proof, then they offer their own private solution, which of course is the 'only' solution outlined in their original agreement. The "solution" of course consists of you giving them all of your private information including government issued ID. How easy is that? This is how Facebook is systematically collecting private information from any account user who they feel they don't have enough information on. How did this all begin? First, it was confirmed to me and I became aware a couple of years ago that Facebook made a sweeping grab at political activists accounts by shutting down many accounts who would then be held ransom in exchange for personal private information. Several prominent activists that I personally know confirmed this information. Some of these general accusations can still be found on Facebook itself. Readers may be familiar with several truth seeking activism websites who were targeted back then. Some were Ron Paul supporters at the time as well as many other prominent activist leaders accounts and hard hitting websites. Back then, word got out that Facebook was telling these activists that their accounts were possibly hacked into and in order to restore the account for "security" reasons they would need to confirm the identity of the account holder with private information (Social security number, government issued ID etc). In one case Facebook demanded a phone conversation with a leading activist that I personally know, confirming the person's phone number, voice (for voice recognition), and private information. All of the activists that I know of seem to have given in to the scam. They went ahead and gave up their private information. In every case, those particular accounts were "restored". My website's Facebook account which is also known for political activism, criticism of government, critical thinking, personal enlightenment and consciousness elevation- all elements seen as a threat to the state- had it's account similarly hijacked early this year without any reasonable or provable justification. Note: Your name must be on the document you submit. Please note that we can't process your request until you provide ID that meets these requirements. In the meantime, your account will remain hidden on the site as a safeguard. We've locked your account because it looks like it might have been hacked. Before we can unlock your account, we need to verify your identity. The fastest way to do this is by completing the account recovery process. To do this, try logging into your account from a computer or mobile phone that you’ve used to log into Facebook in the past. Start with the computer or phone you normally use to access Facebook, and then try any other devices you’ve used. If you can’t complete the account recovery process on your own, please reply to this email and attach a picture of your ID. If you don't have a government-issued photo ID, please reply to this email and attach pictures of at least 2 documents that are from a formal organization (ex: business, school) and combined show your full name, birthday and picture. Please note that we won't be able to process your request unless you send the appropriate identification. And with that, the obligatory "solution" was firmly in place and goes something like this: We claim that your account MAY have been hacked (though we won't as much as show you any proof) therefore you MUST provide us with all your personal identification (so that we will know for sure exactly who you are). Almost one full year of negotiating with Facebook has been futile. Their position is final claiming the only thing that matters is their privately pre-written rules. In every attempt to communicate with Facebook, this second claim of alleged "hacking" (problem B), and exclusive "solution" outlined above, would turn out to be their last resort excuse for hijacking the account in exchange for private information. In order to appreciate the magnitude of this Facebook scam, consider that Facebook all along since its inception and to this day has presented itself as a fun social site for family and friends to mingle and discover each other online, when in fact we are seeing proof that Facebook is more of a private personal information gathering portal to be used by government for political reasons including to control dissent and identify who is saying what. "also collect information about you from other sources, such as newspapers and instant messaging services. This information is gathered regardless of your use of the website"
"By posting Member Content to any part of the Web site, you automatically grant, and you represent and warrant that you have the right to grant, to Facebook an irrevocable, perpetual, non-exclusive, transferable, fully paid, worldwide license (with the right to sublicense) to use, copy, perform, display, reformat, translate, excerpt (in whole or in part) and distribute such information and content and to prepare derivative works of, or incorporate into other works, such information and content, and to grant and authorize sublicenses of the foregoing." 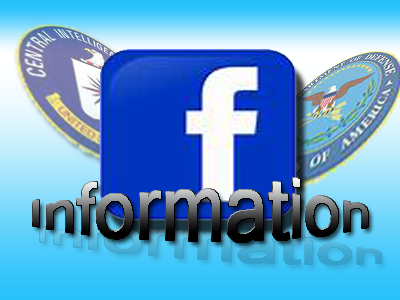 Fact of the matter is that the powers that funded Facebook and are involved in it's activity are intricately interconnected with CIA and U.S. Department of Defense and their desire to gather as much information about everyone for the purposes of the state. Knowing what we now know, it is prudent that everyone think twice about what information you put on Facebook including who you communicate with while on Facebook. Remember all of it is being filed away and recorded to be "legally" used by Facebook in any way they want. The question then becomes, do you need Facebook in your life? This experience has only reminded me how important it is for all of us to restore our human to human interaction. Call someone instead of texting or instant messaging them. Speak to them in person instead of communicating with them on CIA's Facebook. Resist the modern engineered habits that have consumed the younger generation, reducing them to robots who are constantly staring down at their smart phones and IPads. The threefold agenda of Facebook is first the already mentioned information gathering. Secondly as mentioned above, Facebook exists to dehumanize people with electronic relationships instead of person to person and human to human interaction. Many people I speak to are no longer physically or personally contacted by their own friends even family members because those friends and family members have replaced all human communication with electronic communication. This is a direct and deliberate dehumanizing of humanity, all the while your information is stolen. Realize that this dehumanized, poorly-socially-skilled generation was by design. Most Facebook friends are not even real friends you would look to in times of trouble, it's just an illusion of friendship and a signature of how desensitized and dehumanized our civilization has become, all to the benefit of the globalist controlling class. Thirdly but not least Facebook serves as support for the State and whatever its current agenda is. Regularly we hear of organizations and activists on specific political times of the year (elections etc) complaining that Facebook is interfering with a political process. No one should be surprise by this as we have watched as too big to fail private corporations have all become a direct extension of the State. Whether its Google (who owns Youtube), Facebook, AT&T, Walmart, BP, Time Warner and many other giant corporations, the tentacles of big government are all around us now and you best believe they are all working together. Does the Facebook Conspiracy Run Even Deeper? After digging around this Facebook issue I discovered something very odd that I want to briefly mention here. Despite the numerous accusations against Facebook worldwide over the years, when you research the internet for links and stories regarding known accusations of censorship against Facebook, amazingly I was no longer able to find any of these known stories on line. Surprisingly I was only able to mostly find stories that would make you think Facebook is somehow working against government. Is Facebook influencing if not controlling search engine links pointing back to damaging Facebook stories? No one should be surprised if they are. Almost all the stories that I was able to pull up were irrelevant softball stories that would make any naive young web researcher think that Facebook has almost no opposition and has almost no accusations of censorship of (specifically) political activists. Search this for yourself using any search engine of your choice and see what you find. Please share this story and help warn others about what is going on behind the scenes at Facebook. Share your personal stories about Facebook and let's all take a stand against the Facebook scam on humanity. Just remember, everything you've ever posted on Facebook is THEIRS to keep, share with anyone they want and theirs to sell, use against you or anything they can think of... forever! Who do you think is laughing at who? ?